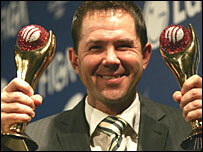 Australia's Ricky Ponting has been named ICC cricketer of the year, ahead of England's Kevin Pietersen. Pietersen was the only England player in the world one-day team of the year but Michael Vaughan was a surprise inclusion in the Test version. Ponting was also named captain of the year after leading his side to their third successive World Cup title. Pakistan's Mohammad Yousuf was the top Test player while Aussie Matthew Hayden took the one-day version. "I am the first player to win this award twice in a row and maybe if I keep my head down there might be more around the corner," said a delighted Ponting after receiving the top award at the ICC ceremony in Johannesburg. "I was happy with the way I have gone about things during the past year and I think we have lifted ourselves to a new level as a team. "It has been an unbelievable 12 months of cricket and we should all be very proud with what we have achieved." Did the right people gain the awards? Aussie Shaun Tait was named top emerging player ahead of England's Ravi Bopara, Kiwi Ross Taylor and Saqibul Hasan of Bangladesh. India's Jhulan Goswami was named women's cricketer of the year, beating England's Claire Taylor to the gong. And Australia's Simon Taufel scooped the umpires award for the fourth successive year, with Mark Benson one of those to miss out.